St. John's Episcopal Church was the first religious institution to be established in Cold Spring Harbor. The first Episcopalian services were held in the little 18th century school house just above the site of the present church. The very first Vestry minutes, written in fine script on September 4, 1831, lists the founders who pledged $2,000 to build a new church. John Hewlett Jones offered to sell three quarters of an acre of land for $300 with the stipulation that "no other building than a church for the Protestant Episcopal Society shall ever be built,...the pews to be let as they think best." The construction of the present church commenced in 1835. Oliver Smith Sammis of Huntington was chosen to be the architect/builder, at a cost of $3,215. Records indicate that John and Stephen Hendrickson of East Woods, L.I. contributed timber, as did Henry Conklin of Brooklyn. The church was fabricated utilizing the post and beam construction method, whereby hand hewn timbers fitted with mortise joints and pegs created the frame for the structure. The interior walls were plastered, and the outer walls sheathed with cedar shingles. The windows were of clear glass fitted into wooden muntons with moveable lower sashes. The floor plan of the church was that of a square room. As for furnishings, it was outfitted with high box pews. The pulpit and communion table were at the south end of the church, and were surrounded on three sides by a communion rail. This arrangement was indicative of the worship modes in the Episcopal Church at the time, whereby the "word" was more important than the "sacrament" during worship. The Rev. Isaac Sherwood, a remarkable self-educated theologian and musician, was called to be the first Rector. It wasn't until April 5, 1837 that the church would be consecrated by the Rt. Rev. Benjamin Treadwell Onderdonk, Bishop of the Diocese of New York. St. John's was founded by the Jones and Hewlett families, and for years the parish was very much under their aegis. Some in the community even considered it to be a family chapel. 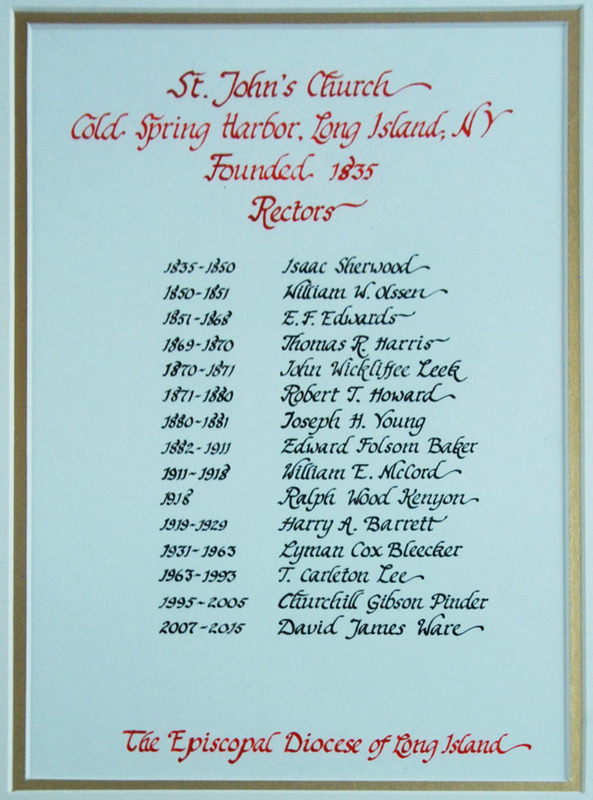 Both families were very influential on Long Island, but the Joneses had the most influence in Cold Spring Harbor. In addition to vast landholdings, they ran what was called the "Jones Industries," an industrial organization comprised of mills and brickyards. They established the village's famed whaling industry in 1837, which flourished until the discovery of petroleum in Pennsylvania 1859. From its founding in 1835 to the time of the Civil War, the church functioned as a small country parish. According to records, the church building itself underwent very few alterations. This simple interior was heated by two wood burning stoves, and in 1847, a pipe organ built by Henry Pilcher of Brooklyn was installed in the gallery. Also around this time, the steeple was added, and was furnished with a bell that was described as having a "silver peal." At the time of the church construction, Joshua Jones and Charles Hewlett Jones gave a piece of land from their grandfather's estate to be used as a church burial ground. This parcel, nestled on the hill above the church, would serve as the churchyard for St. John's. In 1860, a brownstone burial vault with a solid stone door was embedded into the hillside to provide a resting place for several generations of Jones family members. In 1862, John Divine Jones gave 37 acres for a new, more expansive cemetery a mile west of the church. This became the Memorial Cemetery of St. John's Church. The Civil War was not only a major transitional period for the country, but for Cold Spring Harbor and St. John's Church as well. The thriving mills and whaling industry had collapsed, and the village ceased to be the economic hub that it once had been. As for the church, this was a time of great change in the Episcopal Church (and Anglican communion) as the liturgical reforms and adaptations of the Oxford Movement were reshaping the church. The Oxford Movement, which began in England in the 1830s, sought to bring the Anglican communion back in touch with its Medieval heritage. Formal worship styles, ceremony, and the employment of vestments were introduced. More importantly, Gothic architecture became the preferred building style. In America, many colonial churches were torn down and replaced with stone or brick Gothic edifices. St. John's Church, which was in the throes of an economic downturn, most likely did not have the means to tear down and rebuild. The parish did the next best thing, and adapted to the new mode through renovation and decoration. By 1864, a deep chancel, in keeping with medieval traditions, was constructed. The Hewlett family presented the church with a Gothic-style altar (still in use today) which was enclosed by a long brass communion rail. A stained glass window, depicting St. John the Evangelist was installed above the altar. In subsequent years, the church was further "Gothicized" by the removal of the box pews, and the installation of dark oak pews and center aisle. Gothic furnishings, such as chairs and stalls were added. The walls were painted olive green, and enhanced with stenciling. To complement this style, stained glass windows began to appear by the mid 1870s. By the first decade of the twentieth century, all the windows in the nave would be stained glass. The first parish house was built in 1909, and it was around this time that the church was electrified and outfitted with a central heating system. The other major change at this time (1905) was the discontinuation of the Old Mill Dam Road which ran right in front of the church. Known as the Huntington-Oyster Bay Highway (Rte. 25-A), this narrow thoroughfare crossed the lower dam and was crucial link in the North Shore road system. A modern concrete road bed was placed just north of the dam in the salt marshes, and is still in use today. After the Civil War, Cold Spring Harbor became a major resort town, as grand hotels and amusement areas dotted its shoreline. This was the age of side wheeler excursion boats that were loaded to capacity with vacationers. By the turn of the century, the area would be at the epicenter of the "Gold Coast," Long Island's fabled playground of mansions and millionaires. Many of these people would become summer parishioners of St. John's, vastly increasing attendance in the warmer months. For the rest of the year, the church was known as a moribund parish, with a membership of about 50 communicants. It was to this parish that the Rev. Lyman C. Bleecker found himself coming as twelfth Rector in 1931. Among the eleven Rectors who preceded him, the most prominent were the Rev. Isaac Sherwood, Rev. Edward F. Edwards, Rev. Robert T. Howard, Rev. E. Folsom Baker, Rev. William E. McCord and Rev. Harry A. Barrett. Up until this time, no clergyman had exhibited the foresight and adaptability of Rev. Bleecker. During his thirty year tenure, St. John's church was vastly revamped. In the early 1930's, the interior of the church was changed from the dark Gothic, to the bright white colonial of today's church. Electrical and other infrastructural issues were addressed, and the lancet window above the altar was covered by a dossal curtain. In 1936, the Misses Florence L. and S. Elizabeth Jones bequeathed their family homestead (1698) to the church to be used as the Rectory. This venerable structure, with its huge barns and outbuildings was a major enhancement to the church's facilities. Also at this time, the church gained possession of the lower millpond (St. John's Lake), further enriching the parish's holdings. After World War II, the parish (and all of Long Island, for that matter) grew at a precipitous rate. To accommodate the need for space, in 1950 the church building was moved northward, and then eastward by fifty feet onto land fill in the pond. This was done so that the parish house could be enlarged. The added space provided for downstairs offices and the large Isaac Sherwood room upstairs. The chancel was extended by 12 feet. Church services were not interrupted during construction, even while the church rested upon the mover's stilts! By 1962, the church membership was at an all-time high, with 700 families and 425 children registered in Sunday school. The community was now very much a suburban entity, as the era of the "Gold Coast" was rapidly waning. To accommodate the burgeoning congregation, it was decided that more expansion was necessary, and a new concrete and steel parish house complex was completed on property purchased to the south of the church building. Upon the retirement of Rev. Bleecker, the Rev. T. Carleton Lee assumed the position of Rector in 1963. For the next thirty years, Rev. Lee guided the church through a very tumultuous time in American history, a time when attacks on traditional social and religious values transformed society. However, the old traditions and patterns held on steadfastly at St. John's. Even when the 1979 Book of Common Prayer was finally accepted, it was done so grudgingly. During Rev. Lee's tenure, many lasting institutions were established, such as the Day Camp, Hunger Committee, the Blood Drive, and the Mary S. Nicholas Special Music Fund. Even in an era when the Episcopal Church was "modernizing," St. John's always stayed a few steps behind, an example being its determination to keep the time-honored Morning Prayer office for Sunday worship. In July of 2007, the Rev. David J. Ware became the 15th Rector of St. John's. In 2012, a major campaign to renovate and restore the parish complex was undertaken. The church building and parish house buildings were refurbished and renovated, which include the installation of a specially designed Casavant pipe organ. To reflect the new liturgical changes that had become commonplace in the Episcopal Church, the church interior was altered. Among these changes was the reorganization of the chancel and the choir, which required the repositioning of the altar and communion rail. Structures such as ramps, expanded restroom facilities, and even an elevator were installed to accommodate the mandatory handicapped access requirements. Enhanced lighting, plumbing technology, and air conditioning were introduced. Innovative landscaping improvements were also implemented. This renovation was perhaps the most far-sweeping project in St. John's 175‑year history.